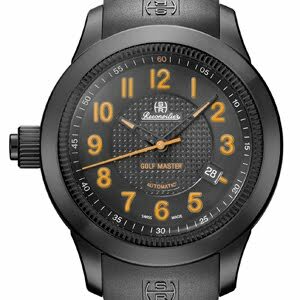 The Hercules Golf Master is the benchmark timepiece for golfers. Its new all-black apparel lends it an even bolder personality. The front shows a traditional three-hand plus date display, while the back reveals a digital read-off instrument. The two sides can easily rotate. With this model displaying distances, front or centre, with measurements in metres or yards, Reconvilier pushes the envelope and revolutionises life on the golf course thanks to its “Caddy”, a GPS receiver which transmits satellite information to the digital module.